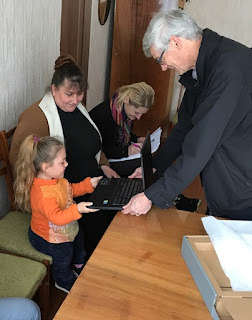 Ben and Lil Stobbe's blogs from Ukraine: Are we getting somewhere? We began this week in the villages and ended in the city of Zaporozhye. The villages we started in were in south Molotchna down by the Juschanlee River. We went to the Cornies Juschalee estate to give a computer to a very small girl who has a very big heart. 11-year-old Alona attends the school in Kirovo and needs a laptop computer to do her schoolwork. We have never been asked to help with anything for this school. One of the teachers heard about our work and approached us about helping Alona. The school principal, Natasha, was delighted that we could do this, and we think that "little Alona" may possibly have opened a big door for the school. Normally children with special needs do not go to school but stay at home and get a part-time tutor. Alona wanted none of that; she wanted to go to school, and her mother takes her every day. After leaving an ecstatic Alona, we went off to see the Reimer estate in Juschanlee. Time is certainly taking its toll on the estate buildings. The large former Reimer house is looking pretty rough, and currently serves as an ambulatory clinic. This is not the only former Mennonite building that is showing its years. Many of the villages in Molotchna are getting smaller and older. Schools such as the one in Udarnik (Neukirch) are closed. The roads between the villages aren't getting any better, and many villages don't have any store at all. memoirs of the village to Ruth Derksen-Siemens and Oksana Bratchenko. Anatoli has done a lot of work in keeping records of the Mennonite story in the Juschanlee south Molotchna villages. His familiarity with German helps him in reviewing documents. wanted a monument to remember the children. At the top of this monument is a bell that rings in the wind. Etched around and near top of the monument are children's faces. The chiming bell reminds us of the children. During this week we visited many schools and continued to focus on English classes. All schools are required to teach English in grade 1. By the fifth grade, the children can opt to learn German or French. We have noticed that English is understood more frequently in stores and restaurants. The challenges for teachers seems to be to move from learning the rules of English to becoming comfortable in speaking English. We believe you as donors are making a significant impact in this area of Ukraine. Young people are excited about their future. The economy is starting to grow. We want to continue to intervene in critical areas where we can really make a difference in the lives of people and in their country.